Feel like you're on vacation every day with boat and jet ski docks just steps from your back door. Taking the boat out for a relaxing tour doesn't have to be a day-long event; you can spend as much or as little time as you need to decompress and enjoy the sites of the lake from a different perspective. With infinity pools, one side wall of the pool is even with the water level of the pool. Therefore, water spills over this edge into a catch basin below, and then the water is pumped back into the pool. An infinity pool set against the backdrop of a natural body of water like Lake Erie blurs the line between your own pool and the lake. One of our customers, Chris Haas, says, "one feature we really enjoy is our infinity pool, with water that appears to flow into Lake Erie." Including an infinity pool in your landscape design enhances your already spectacular view. 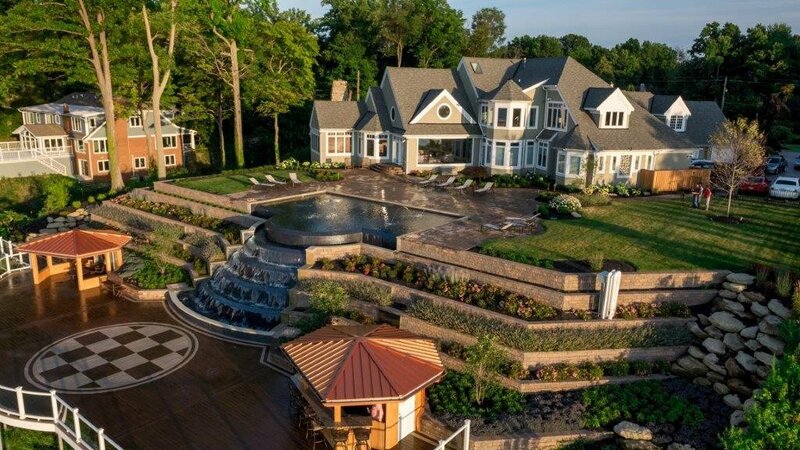 Visually contrasting components like hardscape patios and retaining walls provide an interesting look for your shoreline property. Hardscape is also very practical; you won't have to worry about erosion, and you'll be better able to designate certain areas of your landscaping for specific purposes like dining, cooking, sitting, and more. Between the endless blue of Lake Erie and the hardscaped areas of your property, flowering softscapes add a gentle touch to your landscape design. If you pay particular attention to the flowering patterns of your plants, you can plan to have some plants in bloom nearly all year round. Your outdoor living experiences will extend far beyond the normal summertime gatherings when the beauty of your softscape lures you outside. Lake Erie provides endless hours of beauty and entertainment, but one thing it doesn't provide is shade. Therefore, many shoreline homeowners find that including pergolas and arbors in their landscape design ensures that there's always a shady nook to retreat to during summer's hottest days. Pergolas and arbors also provide height and definition to your landscaping; they make wonderful focal points and keep you comfortable in their pleasant shade. One of the best ways to enjoy your Lake Erie view is to provide a place to sit and dine with friends, and gazebos are a perfect solution. A gazebo is roofed, so even if rain threatens to destroy your outdoor get-together, you can stay outside with your loved ones and enjoy watching the thunderstorms sweep across the lake. Your outdoor living experience wouldn't be complete without a crackling fire for roasting marshmallows. Outdoor fire pits provide a welcome place to socialize on cool evenings, and a fire pit on the shoreline is even better. If you enjoy entertaining large crowds, consider opting for a fire pit instead of an outdoor fireplace. More people can sit around a fire pit than in front of a fireplace. A well-designed landscaping plan on the shores of Lake Erie gives you immediate access to the wonders of nature. From your hardscaped patio or your beautiful infinity pool, you may see bald eagles, sandpipers, and even great blue herons. 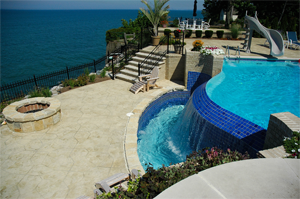 These are some exciting features to add to your outdoor living experience on the Lake Erie shoreline.